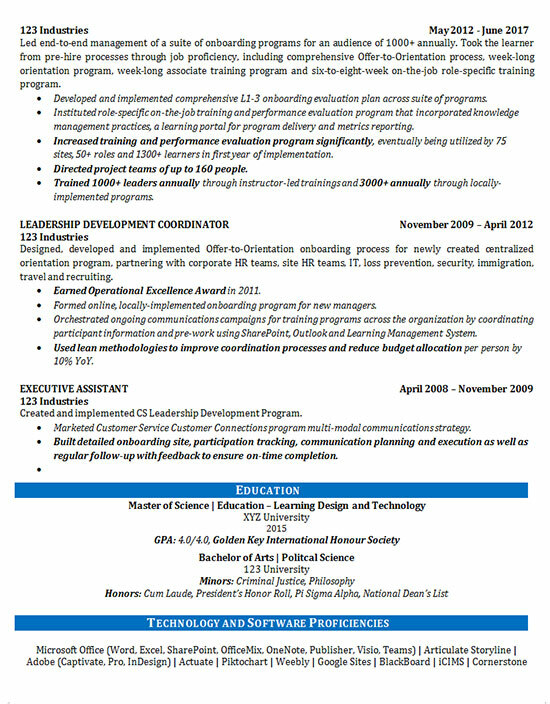 This resume was created for a client looking for a position as the Head of Leadership Development. She just began a new job but may have to relocate for personal reasons. Her experience shows that she has worked in a variety of positions and generally stayed in positions for a few years before moving on. To not have that raise a red flag, we began the resume with a focus on her best qualities and traits. This was accomplished by utilizing an introductory paragraph and summary of qualifications section. These sections give prospective employers insight into how much this client truly has to offer. From there, her professional experience was listed in detail with the most impactful bullet points written in bold font. This should help them stand out to the reader so that the focus is on her key accomplishments. The client’s education, GPA, Minors and Honors were listed next to demonstrate just how impressive her background is in education. Finally, her technology and software proficiencies were listed so that employers are aware of the widespread skill set encompassed by the client. 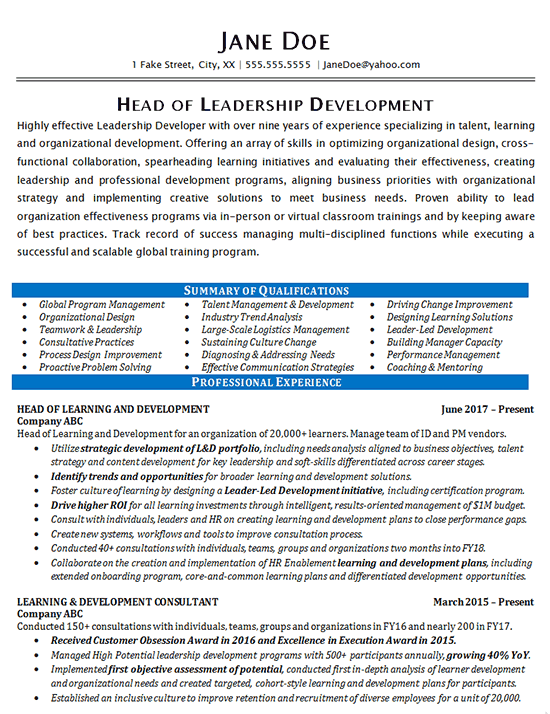 Highly effective Leadership Developer with over nine years of experience specializing in talent, learning and organizational development. 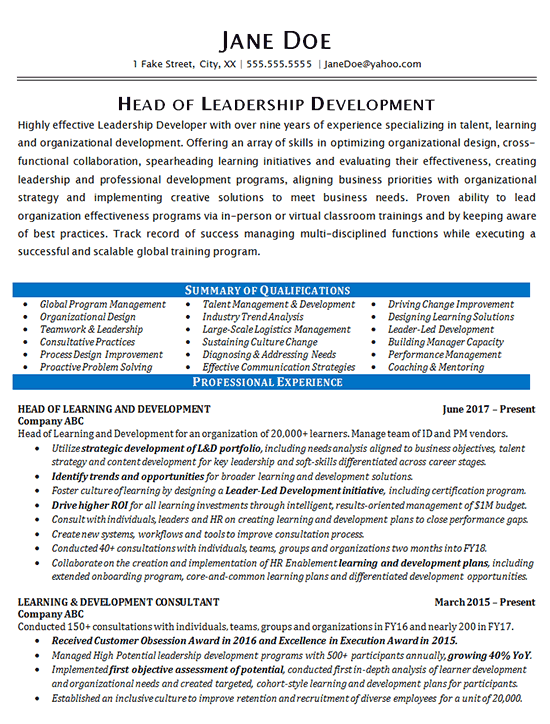 Offering an array of skills in optimizing organizational design, cross-functional collaboration, spearheading learning initiatives and evaluating their effectiveness, creating leadership and professional development programs, aligning business priorities with organizational strategy and implementing creative solutions to meet business needs. Proven ability to lead organization effectiveness programs via in-person or virtual classroom trainings and by keeping aware of best practices. Track record of success managing multi-disciplined functions while executing a successful and scalable global training program. Utilize strategic development of L&D portfolio, including needs analysis aligned to business objectives, talent strategy and content development for key leadership and soft-skills differentiated across career stages. Identify trends and opportunities for broader learning and development solutions. Foster culture of learning by designing a Leader-Led Development initiative, including certification program. Drive higher ROI for all learning investments through intelligent, results-oriented management of $1M budget. Consult with individuals, leaders and HR on creating learning and development plans to close performance gaps. Create new systems, workflows and tools to improve consultation process. Conducted 40+ consultations with individuals, teams, groups and organizations two months into FY18. Collaborate on the creation and implementation of HR Enablement learning and development plans, including extended onboarding program, core-and-common learning plans and differentiated development opportunities.